A familiar sight. :) When I woke up this morning, it really felt like autumn at 4 degrees Celcius. 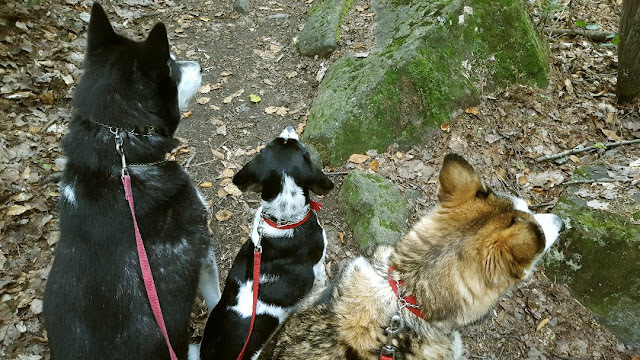 The dogs and I had a great walk up the mountain. They are so obedient, I love this pack. All I say is "Everybody stop" and they stop, then "Everybody sit" and they sit. 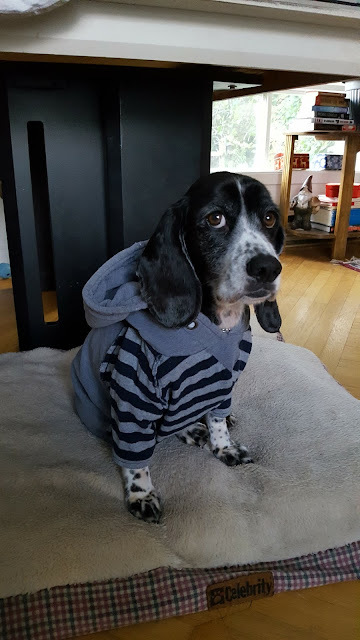 It's nearly sweater-weather for Jack! Two hours later the sun was out and it was 27 degrees!! I was wearing a sundress the whole day! I harvested my potatoes today!! I got a varying size-assortment of 40 potatoes!! :) I was conservative in the spring when I planted the seed potatoes because I really didn't know what to expect, so next spring I'm going to amp it up and and maybe get some more garbage bins, they're not expensive at all. I have two bins, I have the potato bag that Dianna sent me as a gift...and maybe 8 more bins and we should be set for the winter at least! Now I have to figure out how to store them without a root cellar and a potential mouse problem in the basement! The garden cleanup continued today. I had two dead tomato plants, sigh. So I had room to move the 3 Roma tomato containers into Tomato Land where they'll get more sun. Nice to see some red cherry tomatoes in all that green! 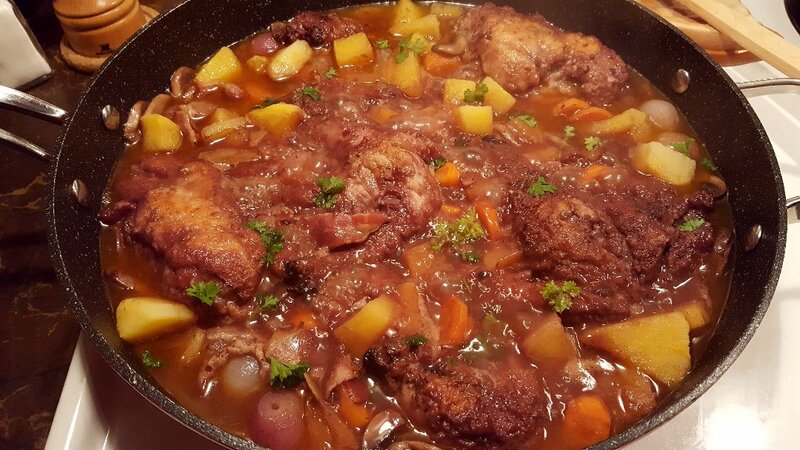 Last night I made a Coq Au Vin from my "Snow Country Cooking" cookbook. I usually make mine in the slow cooker with de-boned chicken breast. But this was more authentic, using the whole chicken and the addition of turnip, which gave a nice flavour. Your container garden has provided well for you. I have yet to dig my potatoes up. I'm putting off until after next week I think. Maybe. I don't have a basement or a cellar. Hence the cellar on the wish list. I store them in my utility room (cooler room) until winter, and some times I use another refrigerator. The lettuce looks great! Oh, my gosh. Are you SURE Jack likes his hoodie?? That face! Congrats on the potato harvest. Not large but you've got some nice looking spuds there. I've been making broth by simmering a turkey carcass for a couple of days. Just a few minutes ago strained it and am now waiting for it to cool (the broth) to put into containers for the freezer. When I work with food like that for a couple of days (I think it's the smell of it permeating the house -- a great smell but almost overwhelming sometimes), I lose my appetite. Having said that, I made blueberry pancakes and bacon for breakfast, and wasn't even hungry at lunch time so we just had fruit smoothies with lots of good stuff in them, and now having to think about dinner, I'm not yet hungry again. So I'm thinking it's gonna be a cottage cheese salad made with fresh veggies from the garden. Not too exciting, but that's what it'll be! Hi Kristina :) We have the basement but we did have mice a few winters back so I'm a little worried. We have an old trunk that we use for assorted "stuff" in the living room, we may bring that down to the basement as use that as a root cellar for now. LOL Mama Pea! I think Jack was more annoyed at the fact that I was making him post for pictures hee hee. He loves that thing. When we say "Okay Jack, time to put on your hoodie!" his tail wages and he sits right in front of us! I am so happy about the taters! My firsts!!! I can't wait to taste them. I have to come up with something to make with potatoes tomorrow. We'll likely try them just boiled at first to see how they taste on their own. I know exactly what you mean! After I cut up the chicken for the Coq Au Vin, I made a chicken broth with the carcass and it was simmering 24 hours and honestly, my appetite wasn't very hearty either. I love cottage cheese and I still want to make yours, I have your recipe bookmarked. I used to have it on lettuce with some tomatoes, yum! Those potatoes look good, I haven't had a good crop in a while and didn't try this year. Mice will eat them under ground here and storage is a problem. Maybe you can make a box with screen over some openings to let air in. 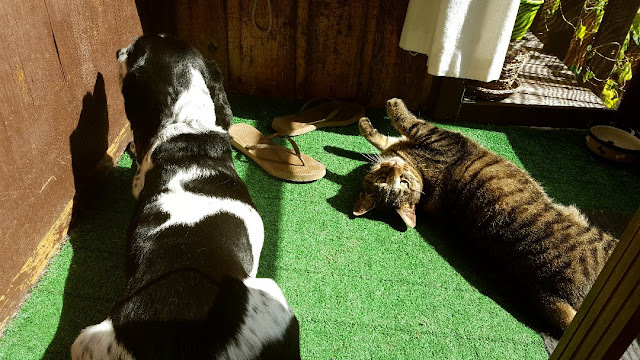 Cute cat and dog! Oh and that coq au vin looks delicious! It would be fitting for a day like we have now, all cool and damp. That photo with Jack wearing his hoodie. OH MY GOSH... SO CUTE! I want to reach through the screen and rub his ears. What a great potato harvest. You have such an amazing garden. I've never eaten coq au vin. It does look delicious! Looks very good Rain. And your potato harvest is delightful. Well done! 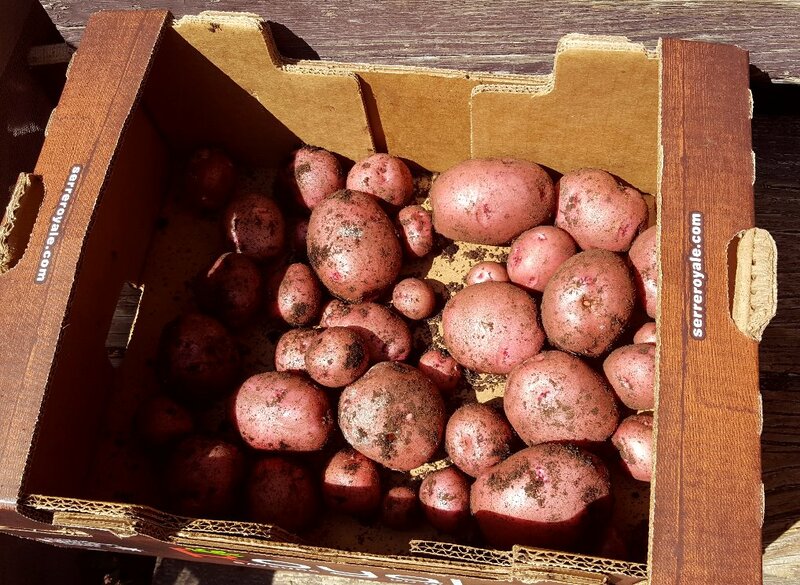 Your garden was such a success and look at all your beautiful potatoes! Now that may be something I could grow that the deer couldn't get to! LOL! I have never made Coq Au Vin (?) but it looks delicious and great for a cool Fall supper if we ever get to 'cool' here! LOL! 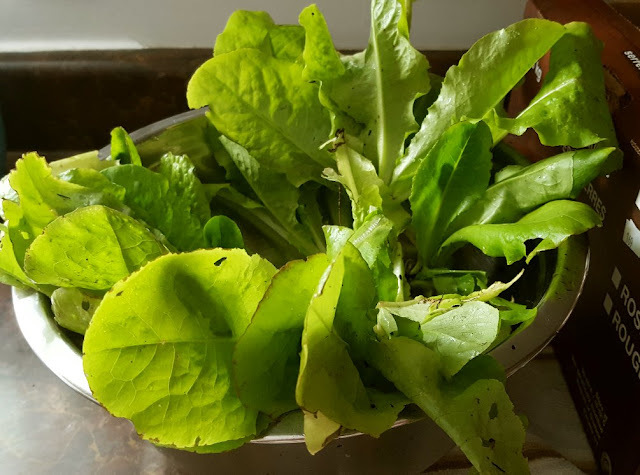 Butter crunch and red oak leaf lettuce are my favorites. Time to plant spinach and other cold weather crops! Jack looks so cute in his 'sweater'! I need to make some for Annie as she gets really cold in the Winter. I love that first photograph - a trio of such sweet little noggins! I had knit a very lovey alpaca sweater for Pepperoni, which he managed to take off (I watched - he backed out of it!) and then shredded. I have a nice fleece jacket for Lovey, who needs the warmth as soon as the temps drop below 55*F. Which it has every single night for the past week and a half! I have baba ganoush and a zucchini corn pie on the menu for this weekend. I might - if I can work up the nerve - smoke a duck! Susan - You're gonna need a REALLY BIG pipe to smoke that duck in. Eeee! I love dogs in sweaters. Great re-purposing of an old sweater too! The coq au vin looks delish! Hi Guillaume, thanks :) I love all types of stews on cool and damp days, we are certainly getting more of those lately. Hi Martha :)) The Coq au Vin is really delicious! There are easier ways to make it, I usually just toss it all into a slow cooker, it makes the house smell so good! Jack is my little cute fella...I rub his ears all the time and he goes into a kind of daze, I guess it feels really good lol! Hi Sam :)) I think you could grow potatoes in bins for sure! Some people even use tires to do it. I bought the cheapest garbage bins I could find, if I remember correctly they were $12 each. After I planted the seed potatoes, I put a little chicken wire on the top until the plants started to grow. I don't have a deer problem here though, but you could easily make some kind of cover as they grow too. It was fun to dump the bin and harvest them! I dumped the dirt all on a tarp, it is back in the bin for next year now. I am loving the buttercrunch! I have to plan my winter garden soon. I'm going to start some winter veggies in the next week or so and I have to build my cold frames for the winter. This will be fun to see if I can grow veggies in the snow lol! Oh, I want to see photos of Annie in her sweater!! Hi Nancy :) I make Jack sweaters because he really doesn't have too much hair on him, his belly is bare actually! He starts to shiver when it gets close to freezing and since he's 11 years old I want him to be comfy. Sometimes it gets to -20 when I take the dogs out. If it's colder than that, I leave Jack at home and he "goes" quickly out in the yard. The huskies are fine, that's their season and they love it! But Jack needs a bit of help...and he needs boots to keep his little toes from freezing! The girls have hairy feet lol, but it keeps them warm. I'm SO happy about the potatoes! I need more!!! Alex said "we'll eat half of those tonight" lol...we eat a lot of potatoes! I have a lot of "Next year"'s for my crops too! Lousy summer for everyone! Hi Susan :)) I LOVE my pack of pups! They are all so good together. Oh gosh...I think some dogs are suited for sweaters and others are definitely not lol...I know, it's been cold here too. It's 15C right now and won't get any warmer, sigh. 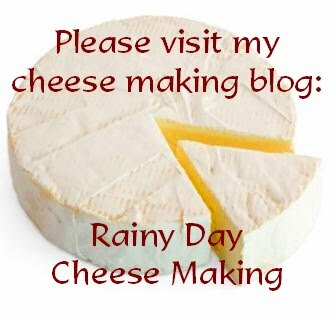 Indoor day for me, but I am making cheese so it's not a loss :) Cheese-making-addict here. Oooh...smoke a duck? I WANT TO SEE PICTURES!!! How will you achieve that? How amazing!! Hello there! 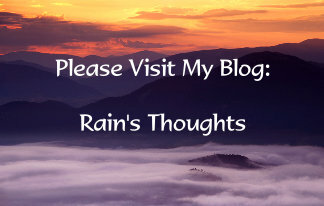 It is always fun to visit a new friend's blog and see what's going on. Sounds like your weather is about 6 weeks ahead of ours. Your furry friends are delightful and I'll just bet that they are a lot of company. I love that you make your own cheese, that is one thing that I have never tried . . . I love cheese and I imagine that like everything else fresh and homemade is better :) Have a lovely day. Nice taters! Jack looks a bit "awe Ma do I have to wear it in front of the other pups?" Good job on the hoodie. Yummy cooking going on. Girl I think you've got it! Your dogs are fantastic. Not only are they very cute but so obedient too! Hi Connie :)) Well, honestly our weather is six weeks ahead of us too lol...usually it's still pretty hot until end of September! The cheese making is a new thing that I started in June and I'm really loving it! Thanks for dropping by! What a cute and lovely bunch that you have trained well. Well done indeed. I love Jack's hoodie! Great idea. And your potatoes are beautiful. I didn't plant potatoes this year and we really miss them. Tomatoes and lettuce looking good too! Thanks Leigh :)) We had some potatoes tonight, oh were they good! Kind of different in texture, we really liked them! 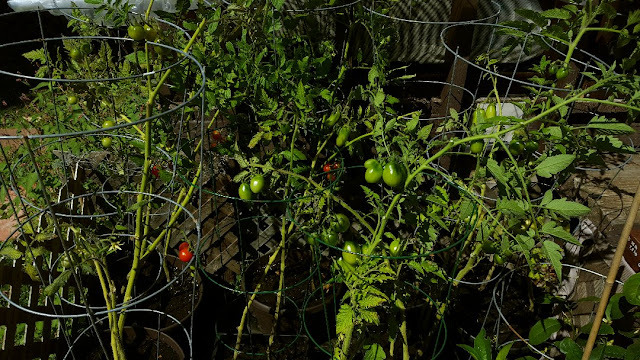 I hope the Romas and regular tomatoes turn red!!! i too loved learning about their obedience as they truly sound very nice pack of lovely pets! I envy with your harvest of potatoes!!!!! It reminded me when mom used to try for potatoes but our land did not sound suitable for potatoes and green chilies . This is 1:30 noon lunch time and your dish is making me jump on it lol ,so delicious looking . I like taking my dogs out with me on walks too. Not just because it's fun to do that with them, but also because they keep me from walking up on hogs, bears, mountain lions, etc. Looks like you got a good many potatoes. That's one of my absolute favorite foods, but the doctor is after me to stop eating potatoes because of the carbohydrates. If I did everything he said, I'd stave to death. yum yum yum, lots of healthy food! Your potatoes!!!! We harvested about 40 as well. Lots of ones on the smaller side...not sure why. But we have eaten them all now so I get to dream about next year. Hi Tammie Lee :) Yes! the healthy food, especially from the garden, is even more delicious! Our potatoes will be gone by week end, no doubt! I want to make sure I plant much more next season! !